High quality copy of the original instruction manual for 45-H series enlargers. 8½" x 5½" format. Staple bound. 23 pages. 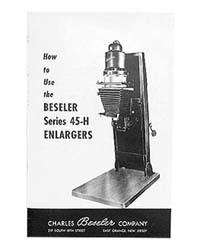 Note: If your 45H enlarger has been fitted with an illumination system other than the condenser or Beslite lamphouse, you will also require the appropriate manual for that system.